John Foster Dulles (February 25, 1888 – May 24, 1959) was a major U.S. political figure who served as U.S. Secretary of State under President Dwight D. Eisenhower from 1953 to 1959. His grandfather and uncle had also served as Secretary of State, and his brother, Allen W. Dulles, directed the C.I.A.. As Eisenhower's closest adviser, Dulles was a significant figure in the early years of the Cold War, advocating a more aggressive U.S. stand against communism than the preceding policy of containment. One of his policy contributions was what became known as brinkmanship, the ability to get to the brink of war but stopping short of actual armed conflict. Along with Eisenhower, he advocated a policy of rollback of communism. He supported the French in their war against the Viet Minh in Indochina and famously refused to shake the hand of Zhou Enlai at the Geneva Conference in 1954. Born in Washington, D.C., Dulles was the son of a Presbyterian minister and attended public schools in Watertown, New York. Coming from a highly influential family, both his grandfather John W. Foster and his uncle Robert Lansing had served as Secretary of State. After attending Princeton University and The George Washington University Law School he joined the New York City law firm of Sullivan & Cromwell, where he specialized in international law. He tried to join the United States Army during World War I but was rejected on the grounds of his poor eyesight. Instead, Dulles received an Army commission as a major on the War Industries Board. In 1918, President Woodrow Wilson appointed Dulles as legal counsel to the United States delegation to the Versailles Peace Conference where he served under his uncle, Robert Lansing, then Secretary of State. Dulles made an early impression as a junior diplomat by clearly and passionately arguing against imposing excessive reparations on Germany. Afterwards, he served as a member of the War Reparations Committee at the request of President Wilson. Dulles, a deeply religious man, attended numerous international conferences of churchmen during the 1920s and 1930s. In 1924, he was the defense counsel in the church trial of Rev. Harry Emerson Fosdick, who had been charged with heresy by opponents in the denomination, a case settled when Fosdick, a liberal Baptist, resigned his pulpit in the Presbyterian Church, which he had never joined. Dulles also became a partner at Sullivan & Cromwell, an international law firm. According to Stephen Kinzer's 2006 book, Overthrow, the firm benefited from doing business with the Nazi regime, and throughout 1934, Dulles was a very public supporter of Hitler. However, his partners were appalled by Nazi activities and threatened to revolt if Dulles did not end the firm's association with the regime. In 1935, Dulles closed Sullivan & Cromwell's Berlin office; later he would cite the closing date as 1934, no doubt in an effort to clear his reputation by shortening his involvement with Nazi Germany. Dulles was a close associate of New York governor Thomas E. Dewey, who became the presidential candidate of the United States Republican Party in the 1944 election. During the election, Dulles served as Dewey's foreign policy adviser. That year, Dulles also chaired the Commission to Study the Bases of a Just and Durable Peace, created by the Federal Council of Churches—the predecessor of the National Council of Churches of Christ. This could be seen as a demonstration of Dulles's commitment for churches to take leadership in attempting to establish a worldwide organization (later to be called the United Nations) so that nations could resolve their differences before conflicts escalated into war. In 1945, Dulles participated in the San Francisco Conference and worked as adviser to Arthur H. Vandenberg and helped draft the preamble to the United Nations Charter. He subsequently attended the United Nations General Assembly as a United States delegate in 1946, 1947 and 1950. Dulles was appointed to the United States Senate as a Republican from New York on July 7, 1949, to fill the vacancy caused by the resignation of Democrat Robert F. Wagner. Dulles served from July 7, 1949 to November 8, 1949, when a successor, Herbert Lehman, was elected, having beaten Dulles in a special election to fill the senate vacancy. In 1950, Dulles published War or Peace, a critical analysis of the American policy of containment, which at the time was favored by many of the foreign policy elite in Washington. Dulles criticized the foreign policy of Harry S. Truman. He argued that containment should be replaced by a policy of "liberation." When Dwight Eisenhower became President in January, 1953, he appointed Dulles as his Secretary of State. Dulles with president Eisenhower in 1956. As Secretary of State, Dulles spent considerable time building up NATO as part of his strategy of controlling Soviet expansion by threatening massive retaliation in event of a war, as well as building up friendships, including that of Louis Jefferson, who would later write a good-humored biography on Dulles. In 1950, he helped instigate the ANZUS Treaty for mutual protection with Australia and New Zealand. One of his first major policy shifts towards a more aggressive posture against communism, Dulles directed the CIA, in March 1953, to draft plans to overthrow Prime Minister Mohammed Mossadegh of Iran. This led directly to the coup d'état via Operation Ajax in support of Mohammad Reza Pahlavi, the Shah of Iran, who ruled Iran until 1979. Dulles was also the architect of the Southeast Asia Treaty Organization (SEATO) created in 1954. The treaty, signed by representatives of the United States, Australia, Britain, France, New Zealand, Pakistan, the Philippines, and Thailand, provided for collective action against aggression. In that same year, due to his relationship with his brother Allen Dulles, a member of the Board of Directors of the United Fruit Company, based in Guatemala, John Foster Dulles was pivotal in promoting and executing the CIA-led Operation PBSUCCESS that overthrew the democratically-elected Guatemalan government of Jacobo Arbenz Guzmán. Dulles was one of the pioneers of the concept of brinkmanship. In an article written for Life Magazine Dulles defined brinkmanship: "The ability to get to the verge without getting into the war is the necessary art." His critics blamed him for damaging relations with Communist states and contributing to the Cold War. Dulles upset the leaders of several non-aligned countries when on June 9, 1956, he argued in a speech that "neutrality has increasingly become an obsolete and, except under very exceptional circumstances, it is an immoral and shortsighted conception." Dulles provided some consternation and amusement to the British, Canadian, Australian, and New Zealand ambassadors by his repeated attempts to tell substantially different versions of events to them. Apparently, unbeknown to Dulles, the men had all attended Cambridge together and followed up meetings with Dulles by comparing notes and reporting the discrepancies to their home countries. Dulles also served as the former Chairman and Co-founder of the Commission on a Just and Durable Peace of the Federal Council of Churches of Christ in America (succeeded by the National Council of Churches), Chairman of the Board for the Carnegie Endowment for International Peace, a former Trustee of the Rockefeller Foundation from 1935 to 1952, and a founding member of the Council of Foreign Relations. Suffering from cancer, Dulles was forced by declining health to resign from office in April 1959, in the middle of Eisenhower's second term. He died in Washington, D.C., on May 24, 1959, at the age of 71, and is buried at Arlington National Cemetery. He was awarded the Presidential Medal of Freedom and the Sylvanus Thayer Award in 1959. A central Berlin road was (re-)named "John-Foster-Dulles-Allee" in 1959 in the presence of Christian Herter, Dulles' successor as Secretary of State. The Washington Dulles International Airport (located in Dulles, Virginia) was named after him. The city of Watertown, New York named the Dulles State Office Building in his honor. In 1954, Dulles was named Man of the Year by Time Magazine. Eisenhower's and Dulles' rollback policy was later implemented by the Reagan Administration during the 1980s and is sometimes credited with the collapse of the Communist Bloc in eastern Europe. On December 1958, Dulles and Dr. Milton Eisenhower attended Mexico's new president Adolfo Lopez Mateos' inauguration, where Dulles made the candid and now well-known quote, "The United States of America does not have friends; it has interests." At the time the statement was actually interpreted positively, but has with time been interpreted by many to mean that America's interests come first. ↑ Time Magazine, TIME.com: Man of the Year. Retrieved March 4, 2008. Hoopes, Townsend. The Devil and John Foster Dulles. Boston: Little, Brown, 1973. ISBN 0-316-37235-8. Immerman, Richard H. John Foster Dulles: Piety, Pragmatism, and Power in U.S. Foreign Policy. Wilmington, Del: Scholarly Resources, 1999. ISBN 0-8420-2601-0. Jefferson, Louis. The John Foster Dulles Book of Humor. New York: St. Martin's, 1986. ISBN 0-312-44355-2. Kinzer, Stephen. Overthrow: America's Century of Regime Change from Hawaii to Iraq. New York: Times Books/Henry Holt, 2006. ISBN 0-8050-8240-9. Marks, and David L. Anderson. "Power and Peace: The Diplomacy of John Foster Dulles." Pacific Historical Review 64(2): 320. Stang, Alan. The Actor; the True Story of John Foster Dulles, Secretary of State, 1953-1959. Boston: Western Islands, 1968. 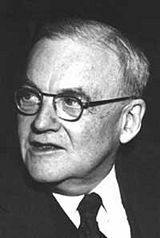 History of "John Foster Dulles"
This page was last modified on 16 May 2018, at 16:08.